An NPC ship is a procedurally generated space dungeon that can appear in any star system at random. It will be displayed with a white ship icon in the navigation console. Players can board NPC ships by navigating their own ship towards the target and then deploying their mech. After exploring an NPC ship, its icon will be shown greyed out. 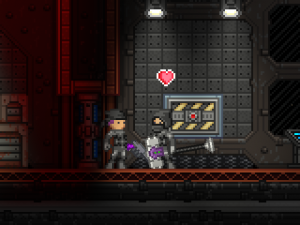 NPC ships can be either friendly or hostile. 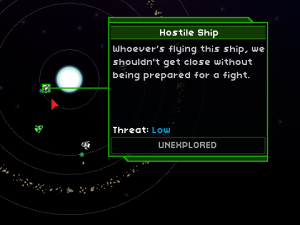 The description and name of the ship will specify whether the ship is hostile or friendly, but other than that, they cannot be distinguished in the navigation console. Astro merchant ships have a distinct astro themed look, complete with orange/white coloring. 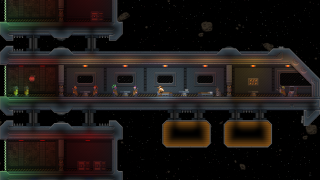 Each of them has one astro merchant NPC in the cockpit, who carries a noticeable backpack and sells several astro objects. Industrial merchant ships have a slate gray, metallic look and contain industrial furniture. An industrial merchant can be found in each of them, who sells various industrial objects. Penguin ships are small rusty space ships with penguin crews. Most containers on this type of ship contain basic space treasure. The only exception is the Decayed Chest on top of the Industrial Computer in the cockpit; it contains a guaranteed Shockhopper Mech Body blueprint as well as one of the following lore books. Research ships have a clean white-and-green appearance, and are outfitted with science-related furniture. These ships tend to be smaller than other non-penguin ships, and have neither merchants nor any unique loot. A pirate ship is an NPC ship with a human bandit crew. Most containers in a pirate ship contain either basic space treasure or space trash. The notable exception is the Industrial Storage Locker in the cockpit, which contains at least one rare space item. 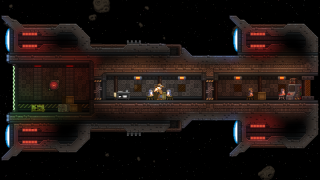 A cultist ship is an NPC ship with a Occasus Cult crew. Apex Ship Locker Storage A locker. Store some stuff, why don't you? Astro Cabinet Storage 110 A modern metal cabinet with floor mounting brackets. Astro Ceiling Monitor Decorative 125 Brackets are built into the base to attach this monitor to the ceiling. Astro Chair Furniture 85 A modern chair design, commonly found inside spaceships. Astro Console Wire 200 A large display built to monitor a variety of devices. Astro Door Door 125 This door forms an airtight seal when closed. Astro Light Light Source 75 A ceiling mounted utility lantern. Astro Monitor Decorative 95 A compact electronic display monitor. Astro Server Decorative 70 A large computer server rack, with brackets for floor mounting. Astro Storage Locker Storage 225 An astro panel storage locker. Astro Table Furniture 85 A solid, floor mounted working surface. Astro Vent Decorative 70 An artificial atmospheric system exhaust port. Astro Wall Panel Decorative 70 A panel designed for inside space environments. Decayed Chest Storage 70 A battered, decayed looking chest. Docking Field Wire 0 This energy field can contain both atmosphere and artificial gravity. Free Standing Console Wire 125 A control console. 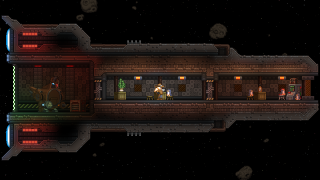 Hylotl Ship Door Door 125 A door suitable for a spaceship. Industrial Canister Storage 85 A sealed metal canister, that might be used to store hazardous liquids. Industrial Computer Wire 140 An old metal computer tower. Untidy cables hang out of its back. Industrial Display Wire 105 A display which appears to be connected to some sort of radar. Industrial Door Door 125 A tough automated door, reinforced to be able to survive intense intergalactic conditions. Industrial Storage Locker Storage 225 A wall mounted locker, complete with hazard stripes and a red light. Landing Beacon Light Source 100 This guidance beacon marks the position of a landing bay. Ship Greeble 3 Decorative 0 A strange piece of ship. Looks like it might serve a purpose, but who really knows? Ship Greeble 4 Decorative 0 A strange piece of ship. Looks like it might serve a purpose, but who really knows? Cultist Door Door 145 A purple door with an eye, fit for an evil cult. Environmental Data Panel Decorative 135 This panel appears to monitor some obscure environmental data. Human Ship Door Door 125 A door suitable for a spaceship. Wrecked Bed Furniture 125 Filth and rust have eaten away at this bed. Thankfully I'm not at all tired. Wrecked Computer Decorative 70 Scratching sounds from the inside... I think something has made a nest in there. Wrecked Console Decorative 70 No chance of this thing starting up. Wrecked Table Furniture 55 A battered old table. Still operational as far as tables go! This page was last modified on 18 October 2018, at 22:58.